At their European championship in Barcelona, it was the 49erFX fleet that was first to launch. As the sea breeze built, it was a much lighter start than on day 1, with the teams crouching on the wings for the first two races, before the wind filled in nicely for race three. 2015 World and European Champions, Giulia Conti and Francesca Clapcich of Italy, jumped into the lead with a couple of okay races in the light ending the day with a bullet. Bekkering and Duetz fell back a few points and sit in second after their blazing opening day, but the winners of day two were the British duo of Charlotte Dobson and Sophie Ainsworth. Their finishes of 1, 2, 3 move them to the top of a three way tie for third. In reality, the points are so tight at the top that the regatta will only be decided in the gold fleet racing. With two qualifying fleets of only 18 boats each, there are many teams able to put up strong scorelines. These Olympic-sized fleets are ideal for those looking to tune up for Rio in August, but the Gold fleet will have all 36 competitors and then the scores will really pile up. The qualifying scenario is not quite so forgiving for the 49er, where the qualifying fleets are 36 and gold fleet will only feature 25 boats. 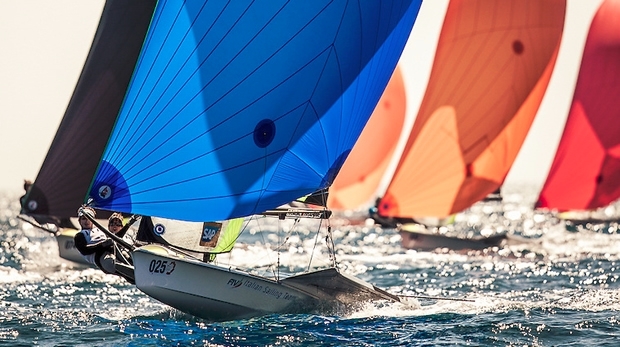 There is the chance for top teams to gain many points in the first days resulting in serious consequences to the latter stages of the regatta. The afternoon breeze for the 49er fleet looked like it would mirror day one and be fantastic, but under bright sunshine the wind was much more unstable and difficult to read than expected. The results showed this instability, with all of the top teams taking at least one race farther down the ranking than they’d hoped for. Farther down the leaderboard than desired is a different standard for some than others, and for Peter Burling and Blair Tuke their worst slip-up of the day was still a sixth placed finish in the day's final race. They lead the championship by 10 points by adding today a 1, 3, 1, before their sixth. Tuke noted how tricky conditions were, unexpectedly so, and said they were all over the start line in the various races to try and get a handle on the wind. Having an outstanding day by any normal standard were Austrians Nico Delle Karth and Nico Resch. They scored a 3, 16, 3, 3 and are on a roll following the past few events. Having reached the podium at the Worlds appears to have given them a boost of confidence at the perfect time in the Olympic cycle. Britain's John Pink and Stuart Bithell had an impressive day, scoring only 17 points in four race day when they could not absorb a discard. They leaped up the standings to be the top British boat and look forward to staying there for the rest of the week and potentially locking up the British selection. How much Burling and Tuke being in the heads of their main competitors makes a difference is hard to know, but they’re always at topic of discussion. Whether it is amazement, observation, discussion, surveillance, or bar talk, how they are doing what they’re doing is the great mystery of the 49er class. This Europeans represents the last real chance for teams to knock them off in a championship format, and move them somewhat off the mental pedestal. While there are four days to go and plenty of room to stumble, it seems like having someone, anyone, beat them at an event before Rio might be pretty important to the fleet psyche. Racing continues on day 3 with more qualifying, followed by three days of Gold fleet racing in addition to a medal race on the final day.